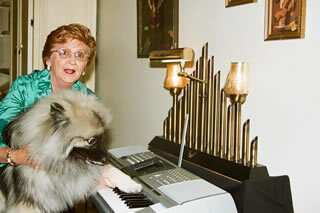 (Feb, 2009) I live in Arizona with dog who "thinks" he plays keyboard! I've played piano, accordion, organ, guitar thru the years and now play a PSR-3000. I am thoroughly fascinated by all the variety this "one man orchestra" has and have enjoyed sharing and learning with other members of this wonderful PSR Tutorial! I was active in the exciting years of The Accordion Orchestras, participating with Pietro Deiro, Charles Magnante in New York and Palmer-Hughes duo from the University of Houston. I studied in Minnesota where my "unknown future husband" was a partner in a music studio. After marriage, we did some entertaining and started our own music studio in Owatonna, Minnesota. Now 53 years later, I'm still working for "that man!" 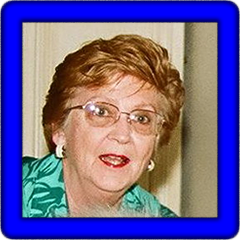 Gloria has provided 30 songs in midi format. These were created on the PSR-3000 (3k) or the PSR-S910 (91). Individual songs are shown in the table below and any one song can be downloaded by right-clicking on the song link. Download all of Gloria's MIDI files here: GH-3k-91.zip. The table displays the song title, tempo (T), time signature (TS), lyrics (L), chords (C), where possible, the style used, the original volume (V), and the keyboard used (K). Gloria's songs are listed by song title. Click on the song title to listen to and/or download the song.